"The hit PC game, The Sims has finally landed on the PlayStation 2 that not only pays homage to the original version but actually goes one step further." The Sims has almost a cult following around the world, whether these fans are from Australia, England, France or the United States, they all played (& still do) one of the most strangest games to ever grace the world of gaming, a game that can only be described as a "life" simulation. The premise of The Sims is quite simplistic, you must help your Sim live their everyday life by helping them cook, relax, go-out, make friends, clean, find a career and help them fulfil their dreams. The developers of The Sims for the PlayStation 2 have gone one step beyond the PC version that doesn't leave a stale taste in your mouth of some cheap PC port. On the contrary, The Sims on the PS2 has been reprogrammed, improved and made to feel like a dedicated console game. 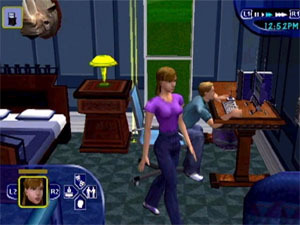 The main theme of The Sims is still there but it also includes new features such as goals and tasks that your characters must now perform. The most notable differences are the graphics and the control system of the game. The control system of the PlayStation 2 version is thoroughly enjoyable and you virtually use all the controls on your DualShock to move around the life of your Sim. The analog sticks are used to rotate your camera angles and zoom in and out on your characters lives while the d-pad gives you instant access to your characters attributes such as personality and relationships. Before starting the game, you must create the character who will be your Sim and give them a name. You can virtually shape your character to look like a number of people and even yourself by changing a variety of attributes such as body size, hair styles, facial hair and clothes to name just a few of the things you can select. 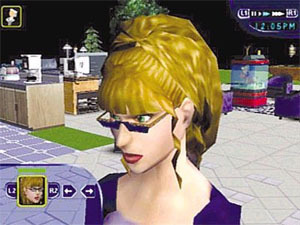 Unlike the PC version, there are three different modes of gameplay that include "Get a Life" that lets you engage your Sim in a mission based game that has you starting from rags and hopefully ending up in riches. While the "Freestyle Sims" mode is an open-ended free play game that lets you interact with an entire neighbourhood of Sims. Last but not least is the Two Player game that allows you to challenge a friend to a variety of different challenges such as making friends, eating competitions and various other outrageous mini-games. However, the main method of gameplay is the "Get a Life" mode that lets you engage your Sim in a variety of challenges that start from the basics and eventually lead you onto a whole plethora of important challenges in life such as careers, marriage and family. The game starts with a beautifully choreographed day-dream sequence of you living in luxury with the girl of your dreams. As you both become acquainted, you are interrupted by your mother telling you not to day-dream all the time. This introduction to The Sims is very simple but cute and is a glimpse of what The Sims is all about, trying to make your dreams come true. The first level of the "Get a Life" mode gives you a set of goals to achieve while you are living at home with mother. As the game progresses, you must then set your goals onto more important and individualistic goals such as starting a career, buying a house and eventually getting married, if that is what you desire. Although these are long-term goals, the more basic goals revolve around you cooking food, watching TV, inviting friends over and even going to the toilet. If you fail to achieve these short term daily goals, your life will soon fall apart until its nothing more than despair and poverty. As you progress through the game, you will eventually get a wage that will allow you to buy a variety of items for your house such as lamps, televisions, stereos, pools, computers and a whole plethora of worldly items. Graphically, the biggest different between the PC version and the PS2 version is that the game is now fully 3D and all characters and items are now made up of polygons which is a huge improvement over the PC version that used sprites. The introduction of polygons now allows the game to have more realistic characters and gaming environments, not to mention extremely smooth gameplay. The soundtrack to The Sims is almost identical to the PC version and almost every other Maxis game on the market that has this surreal jazz music that plays in the background of the game. Although not intrusive, the music portrays the happy world of The Sims that won't become annoying until you start messing up your character's life. Thankfully, another feature that made the transition from the PC, is the way the characters talk in the Sims that sound vaguely familiar like Mr. Bean, a chirpy voice that goes up and down, depending on how your character is acting. To put it quite simply, the voices of The Sims are perfect. The other small touches that have been implemented into the game are the sounds of everyday life such as the noises of the television, radio, telephones, cooking, eating and everything else that you hear in your daily life. In conclusion, The Sims is the perfect addition to your console gaming collection as you can now sit back on your couch and help Sim characters live a life and luxury and fun. The Sims may not be for every gamer because of the mellow content but it sure does give PlayStation 2 owners something different. 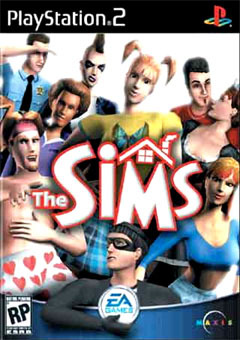 With cute, colourful and basic graphics, amusing sound effects and highly addictive gameplay, The Sims is the perfect game for just about everyone who owns a PS2. Highly Recommended!